I know I'm not alone in what seems like the never ending search for the perfect chocolate chip cookie. If you're still wondering if such a thing exists, I promise you that it does...and the recipe is right here. Well, let me back track a bit. I realize that 'perfect' is going to be different for everyone. Some like it crunchy, some like it chewy, some like milk chocolate, some like dark chocolate. So if your idea of the perfect chocolate chip cookies happens to be a soft, chewy, dark chocolate, super savory kind then I will repeat, the recipe for the perfect cookie is here. Now, there are a few important things we need to discuss. If you want a cookie that's extra special, it means the recipe is going to have a few extra special things. And this cookie does. Please, don't skip these! The first thing that makes this cookie different is that it uses browned butter. You're going to make browned butter. I first learned of this when I read this recipe from Two Peas and Their Pod. I tried this recipe and for whatever reason, it was a bit of fail which came from something I learned about browned butter: you need to measure. When you make browned butter, the water in the butter is going to evaporate so what you need to do is then replace this lost water by increasing another liquid in the recipe. But, if you're not exact in how much liquid to add you could either end up with really dry or overly wet dough. I ended up with overly wet and was never able to salvage the dough. So, in my recipe below, I've noted for you what measurement of browned butter you should end up with after the browning process and how much vegetable oil needs to be added back. I then read recipes about creating a flat and chewy cookie, like this one here, combined elements and added my own taste-testing changes and was practically singing "Hallelujah" when I took the first bite of one of these cookies. The second thing about this cookie is it uses a combination of all purpose flour and bread flour. I use almost equal amounts and bread flour adds the extra special chewiness that you're not going to get from just using only all purpose flour. You can find bread flour in the same area as the all purpose flour, although I needed to buy a big King Arthur bag, I didn't see smaller bag sizes. Next, you're going to chop up your own dark chocolate. That's right, skip right past the familiar bags of chocolate chips and find the bars of chocolate. As you'll see in my recipe, I really liked Lindt 78% Dark Chocolate. It's just dark enough without being bitter. The next thing about these that's going to change your life is the use of sea salt instead of regular iodized salt. Trust me, this is so worth it. Getting that sea salt flavor combined with the browned butter and dark chocolate is so incredible, you'll never want a boring chocolate chip cookie again. Oh...you need to chill the cookie dough for 30 minutes before baking. Hang in there, we're in the home stretch! You really need the dough chilled so that these will spread to the perfect consistency when you bake them. Not too puffy, not too thin. When these come out of the oven, you're going to lightly bang the cookie sheet a few times on the counter, shake it back and forth, to encourage the cookie to settle flat and the melty dark chocolate to spread and pool. I also took my spatula and very very gently give a small press to the tops. Ok, that's it! I really hope you enjoy these, I bought some dark chocolate today just so I could get some of these in the oven as soon as possible. 2. To make the browned butter, place the butter in a sauce pan or pot and melt. Once the butter is melted, turn the heat up until the butter simmers and cook 3-5 minutes. Whisk constantly and keep an eye on this because butter can burn fast. You don't want a roaring boil, you want a light bubbly simmer. What you're doing is browning the milk proteins in the butter. You'll notice it will get a rich nutty smell and the color will start to turn a caramel brown. I've found 4 minutes has worked well for me. Once browned, pour butter into a heat safe bowl and let it cool slightly. (Now, here's where the exactness comes in). Pour the butter into a measuring cup, you should be right at 3/4 cup. If you have too much, pour out until you measure 3/4 cup. If you find you have less than this, add a little vegetable oil until you are measuring 3/4 cup. 3. With your browned butter in a bowl, whisk in the 2 tablespoons of vegetable oil, bot sugars, and the vanilla. Whisk in each egg one at a time. In a separate bowl, whisk together the flours, baking soda, and sea salt. Gradually add the flour mixture to the butter mixture. Lastly, stir in the chopping chocolate. 4. Form your cookie dough balls and place on baking sheet, chill for 30 min (don't skip this!!) Once chilled, bake for 9 minutes. When they come out of the oven, lightly bang the cookie sheet a few times on the counter, shake it back and forth, to encourage the cookie to settle flat and the melty dark chocolate to spread and pool. I also took my spatula and very very gently give a small press to the tops. Let cool on the sheet for 5 minutes before moving to a plate. These are incredible warm! I loved heating them up in the microwave the next day. I'm the Queen of Cocktail parties. Yes, I made that title up and bestowed upon myself. But, my 6+ years of event planning means I've amassed a great deal of knowledge and experience with how to plan a party menu. Here are a few tips for throwing a successful cocktail party that will definitely 'wow' your guests! It's a cocktail party after all, right? I'm a big fan of having a bar with options for your guests. Stock one type of beer, a white wine, and a signature cocktail. Now this doesn't mean you're going to be embarking on complex mixology, just have an interesting option for guests and make it easy on yourself. Pre-make a spiked punch that guests can self serve, or print a cute cocktail recipe for guests to mix up the drink on their own. In the spring and summer I love limoncello and will use my big drink dispenser, fill it with limoncello, vodka, and lemonade. Toss in some fresh cut lemons and you've got the perfect refreshment. Did I just make up a new word? Not sure. But what I mean by this is always consider how easy it is to eat the items on your menu. Pinterest is a great source for ideas for oh so cute appetizers, but so often I see things that would just be damn near impossible to eat and carry on a conversation. If the food requires you to deconstruct it before being able to take a bite, it's not a good idea. No, I don't mean parade them through your kitchen and proudly present your garbage can. Some finger foods will require things like tooth picks. Place a small bowl or plate next to this dish so there is a place for discarded tooth picks. The one step most people over look? You need to show your guests what to do. Put a couple tooth picks in the bowl so they'll know exactly what it's there for and follow the lead. This one might be a little obvious, but it's an important one. Try to not have the same ingredient across many dishes. This helps create a balance spread and makes sure there is a little something for everyone. If you have a super cheesy dip, pair that with a crudite platter or cucumber dill sandwiches. Make sure to have some meatless options. If you're serving a chicken dinner, don't have a chicken-based appetizer. It's always a good idea to have a mix of hot and cold apps. This will also help to balance your spread and have a nice assortment of snacks. The presentation of your spread is just as important as the menu. Use a mix of different types of bowls and platters and have displays of different heights. Tiered displays or pedestals not only add dimension to your spread but they also help you fit more onto your table. A beautifully designed spread will entice your guests to indulge and keep them coming back for more. I'm a big fan of this one, but this isn't going to be needed at every party. If you're planning a get together that you think is going to go into the after hours, be ready with that much needed late night snack. This can be super simple, I'm talking popcorn, chips or cheese and crackers. But when everyone is having that one last signature cocktail who doesn't want to be snacking on a little something? So as you're planning for your next cocktail party make sure you get this on the menu. This cheesy corn and red pepper dip is one of my favorites for so many reason. First, I love that this isn't a cream cheese based dip. Nope, no cream cheese here! Eliminating that heaviness really helps the flavors of the corn, cheese, and red peppers shine through. Second, this is a really versatile dip and you can add more fixins like bacon or jalapeno. Last, this is easy! Who doesn't love that?! 2. In a pan over medium high heat, heat the EVOO then add the red pepper and onions. Sauté 3-5 minutes. Using a zester, zest in the garlic clove and add the corn and saute another 5-7 minutes, letting the corn become browned. Remove from heat. 3. Pour the corn mixture into a bowl and add the mayo, cheeses, and garlic powder. Salt and pepper to taste, and a dash of cayenne pepper. Go very light on the cayenne to start, it's very powerful and a little goes a very very long way. Pour into a baking dish. 4. Bake for 20 minutes, then place under the broiler for 1 minute to get the cheese browned and bubbly. Serve with assorted chips and crackers. Since I love this Chocolate Chip Cookie Dough Pie recipe so much, I've been thinking of ways I can make some adjustments to it and create new delicious versions. Right before Christmas it hit me: Red Velvet Chocolate Chip Cookie Pie. Oh my. And with it being the Holiday season, how perfect would it be to have a deep red colored dessert! But here's the thing, I realized I forgot to buy the red food coloring and there was no way in hell I was running to the grocery store the day before Christmas for one little ingredient. So creating this pie was put on the back burner until last weekend and boy was this worth the wait. Now, I'm not really a fan of traditional red velvet with the cream cheese frosting. It just...doesn't do it for me. So when I wanted to come up with a red velvet recipe I knew that there also had to be a major chocolate component and instead of a cream cheese based frosting this gets top with vanilla bean ice cream. This is so warm, so chocolatey, so decadent. The color is also very rich and saturated and makes this not just incredible to eat but incredible to look at too. 1. Red food coloring is very potent and will stain everything easily. I mean everything....your hands, countertops, clothing. Be very careful when pouring and stirring, and definitely put the cap on the bottle as soon as you're done pouring. Trust me, you do not want a red food coloring spill. 2. Before placing this in the oven I sprinkled a few extra chocolate chips on the top. 3. Make sure you're not using a deep pie pan, if you are the pie filling won't be quite high enough to meet the crust. 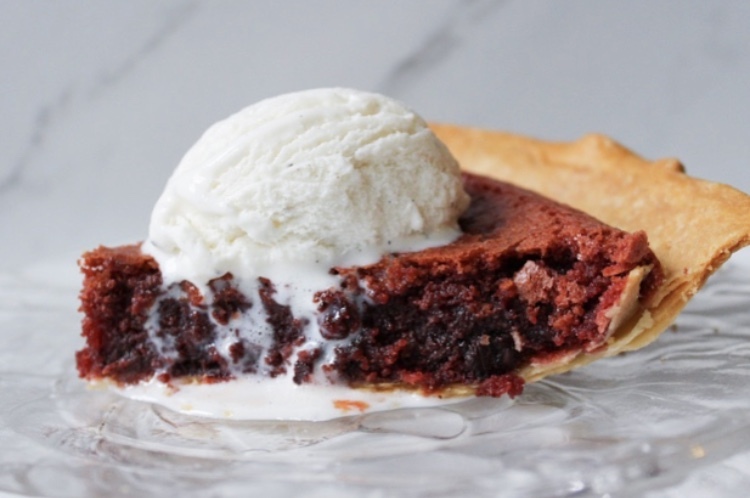 This red velvet chocolate chip cookie pie is best served warm. Make sure to pop it in the microwave a bit then scoop a nice big serving of vanilla bean ice cream. 1. Heat your oven to 350. Pre-bake your pie dough for 10 minutes, make sure you've pricked the bottom with a fork a few times to avoid it bubbling up. After crust has pre-baked, reduce oven heat to 325. 2. With your mixer, beat the eggs for 3 minutes until foamy. Then beat in both the white and brown sugars, flour, and the softened butter. 3. Remove from mixer and by hand, stir in the red food coloring, cocoa, and vanilla. Lastly, fold in the chocolate chips. Pour into pie shell and sprinkle the top of the piece with a few extra chocolate chips. Bake for 50-60 minutes until a knife comes out clean from the center of the pie. I check it at 50 minutes, then add a few minutes at a time if the center is not quite done yet. Serve warm with vanilla bean ice cream! Ya know what's something that makes me feel really old? The fact that the Jeopardy and Wheel of Fortune back-to-back lineup is part of my evening TV watching. That hour from 7pm-8pm is my time to unwind for the evening, have a glass(es) of wine, eat some dinner and test my knowledge of trivia and puzzle solving skills. My husband can confirm that it frequently turns into me shouting answers at the TV in complete amazement that the players don't know the answer. Admittedly, I think being contestant on Wheel of Fortune would totally be something I'd want to do if it wasn't something that was broadcast on National television. I could picture it now, Pat Sajak would start the show with the little segment where he greets each player and asks a few "tell me about yourself" questions. I'd freeze. What's my name? Where am I from? What do I like to do? If I could get over my intense stage fright and actually manage to open my mouth and speak words I'm sure it would be an embarrassment of stumbles, stutters, and totally wrong answers. So for now, I'm content to play from my couch and yell out answers as if I'm the one winning the cash. If you like Alfredo sauce like I do, you really need to make it from scratch. Now I know I know, I know they sell the jarred version in the grocery store and trust me I'm not one to be all snooty about time-savers and cutting a few corners on a busy weeknight. But when it comes to getting the authentic fresh creamy taste of Alfredo sauce, the jarred version just isn't going to cut it. Not convinced? I'll share a story, I swear this is a true story. 1. There's a very special ingredient you can't skip. It's the secret ingredient that takes Alfredo sauce from being a regular old cream sauce to warm and savory. Know what it is? Nutmeg! Yes, nutmeg. The same nutmeg we use in our pumpkin spice. Trust me. Do not skip this ingredient, it's just not going to be the same. 2. Using some of the water from your pasta cooking pot is the best way to thin out a cream sauce that has gotten too thick. Sometimes this happens, when you simmer a cream sauce especially one started with a roux it's going to get a little thick. You don't want to add more cream to thin it out, that will make the taste too creamy and dull out the rest of the flavors. So, as you notice the sauce getting a tad too thick, add half-ladles at a time of the boiling pasta water into the sauce pan. 3. I'm really into using a zester to grate my garlic. Chopping it is ok too, but when you zest it you get more of a paste and I find it cooks more evenly and gives stronger garlic flavor throughout the dish. 4. Lastly, I hate cleanup. Hate it. So, as a cleanup time-saver instead of returning the drained pasta to the pasta pot and pouring the sauce into that pot, I take the drained pasta and pour it into the sauce pan. This means I only have one Alfredoy-saucy pan to clean after dinner...and that's a very good thing. 1. Cook the fettuccine noodles to package instructions. You're going to be using some of the water the pasta is cooking in. 2. While the pasta is cooking, melt the butter in large sauce pan over medium heat. With a zester, grate the garlic cloves into the butter. Saute for about a minute and a half until the garlic pieces are lightly browned. Add the flour and cook about a minute, then add the light cream, Parmesan cheese, nutmeg, salt, pepper, and garlic powder. Simmer 10-15 minutes until thickened, stirring occasionally to prevent a film from forming over top. Now, cream sauces need a little extra attention. If the sauce is looking a little too thick, with a ladle spoon in some hot pasta water and stir to loosen the consistency. Use about half a ladle at a time. 3. Once the sauce has simmered and the desired consistency is reached, add the cooked and drained pasta into the Alfredo sauce pan. Stir to coat all of the noodles. 4. To serve, plate the fettuccine noodle and top each serving with about 1/3 cup pease, crumbled bacon, and garnish with more grated Parmesan cheese. Every year for my husband's birthday, which happens to fall over Labor Day, we rent a cabin in the Catskills and enjoy a few days of the beautiful outdoors. Since we live in New Jersey just outside of Manhattan, the escape to the solace of the mountains and woods is something we look forward to every year. Admittedly, I like that the cell phone service is spotty. It makes the decision for me to stay off my phone and connect with the people I'm with. Don't get me wrong, as a blogger and Instagrammer I love the connectivity, but sometimes we all need a few days to step back and disconnect. This year, we went with another couple and rented a new cabin and had an absolute blast. The babbling brook was the perfect soundtrack to our morning coffee (ok there were mimosas thrown in there) and by night we built a large fire in the newly installed fire pit. Oh, something about the outdoors? Wildlife. I definitely got a little on edge when a huge pack of coyotes howled by sounding like they were just an arms reach away. And a rouge skunk helped himself to a bit a food we accidentally left out. But this is our yearly escape and each year we learn a bit more about making a successful cabin vacation. If you find yourself around a campfire you're probably not too far away from s'mores ingredients. But, as you read above, we live just outside of Manhattan. City-dwellers and anyone without access to a background deserve the pleasure of a delicious chocolaty marshmallowy s'more too, right? Right. Now, you're never going to guess where this recipe is from. Go ahead, make a guess. Did you guess Richard Simmons? The Sweatin' to the Oldies Richard Simmons? Didn't think so. When we were kids my mom bought a few of his cookbooks, one of them being dedicated totally to desserts called Sweetie Pie and this is his recipe for an indoor s'more. The chocolate spread is addicting. I promise you, make these once and they're going to be a recipe you return to over and over. Did I mention they take less than 10 minutes to make? A note about marshmallow fluff, I found it in my grocery store down the baking aisle on the very bottom shelf near the spices and sugar. 1. In a small pot over medium-low heat, melt the chocolate morsels and sweetened condensed milk. Once melted, turn off heat and stir in the cocoa and powdered sugar. 2. To assemble, spread chocolate mixture onto one graham cracker and desired amount of marshmallow fluff on the other, combine to create your s'more. The amount of fluff really depends on your taste!